What role should America play on the world stage? What has been its exact role historically? Is our current position in the world a break from tradition -- or a continuum? Is America a force for good -- or is our international involvement the source of many of the world’s problems? 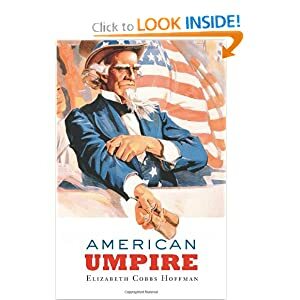 In American Umpire, Elizabeth Cobbs Hoffman offers a sweeping, wide-ranging, and remarkably in-depth overview of the history of American foreign relations. In a work bound to inspire fierce debate, Hoffman, the Dwight E. Stanford Professor of American Foreign Relations at San Diego State University and a National Fellow at Stanford University’s Hoover Institution, argues that those that criticize America’s role in the world have it all wrong: “One of the most commonly held scholarly assumptions of our day -- that the United States is a kind of empire -- is not simply improbable but false” (5). Above all, critics do not understand America’s history. The Peace of Westphalia in 1648 started a process whereby “the world of monarchies and empires disappeared” (3), a trend that continued to the 1991 breakup of the Soviet Union. The birth of the United States “was the pivot of this worldwide transformation,” because of what it symbolized. To Hoffman, the accelerating trend towards democratic capitalism has been shaped by “access to opportunity, arbitration of disputes, and transparency in government and business.” Hoffman has an optimistic tone throughout; she writes that the second half of the past century “witnessed greater global economic development than any other period” in human history. Democratic capitalism, she argues, “brought down the world order known as empire.” Hoffman also asserts that “1898 to 1946 was the one and only period in which the United States sustained an Empire” (3-13). Regarding America’s expansion, overall, people wanted to be a part of the United States, she writes, and regarding our overseas military bases, asks: “why do so many other countries welcome them?” Hoffman’s thesis is that “the United States acted not as an empire in modern foreign relations, but as a kind of umpire, to compel acquiescence as necessary with rules that had earned broad legitimacy.” One reason America was comfortable in this position internationally was “because of its own historical experiences of domestic conflict.” While America is no angel, and while the nation’s lofty rhetoric often falls short, “this does not make it an empire, nor does it mean that America’s highest ideals are hollow illusion” (16-20). Hoffman begins by looking at the period between the Peace of Westphalia and 1789, when America would “fashion a republic of republics.” Hoffman then gives a broad overview of key trends in European history: the Peace of Westphalia “brought the first inkling of the new world order—and set the stage for American history,” and the Reformation not only caused people to settle New England, “but also set the stage for the colonies’ later rebellion.” Out of the colonists’ struggle for unity following the debacle of the Articles of Confederation came the need for an arbitrator, and at the Constitutional Convention the Founders “entertained proposals for a type of ‘umpire’ to guide compromise,” with Madison arguing for a “dispassionate umpire in disputes.” Hoffman writes that “the founders sometimes called the proposed central government an umpire, other times an empire” -- though they saw America “as different in kind from all proceeding empires,” and by umpire meant, in Hoffman’s words, “a decisive power in politics.” They did not want to emulate Rome, and when they used the term “empire,” meant “internal coherence, not … dominance over populations beyond America’s political boundaries” (21-51). Between 1789 and 1800, in the aftermath of the French Revolution, America, faced with a variety of real and potential domestic uprisings, wrestled with how to exercise federal power, “or ‘umperialism,’ if you will.” She offers a fascinating intellectual background of the economic, political, and philosophical ideas that shaped the founders’ world, as well as how Adams, Madison, Hamilton, Jefferson and Washington sharply differed with respect to the course America should take with regards to internal divisions and, most acutely, towards the rest of the world: “Foreign relations fatefully split the founders” (53, 74). Hoffman then looks at the era between Jefferson’s inauguration and 1815, a period described in her chapter’s subtitle as “How Economic Sanctions Became a Tool of Foreign Relations.” Jefferson tried to put in place economic policies that would minimize the risk of war, yet his policy of “peaceable coercion” bares much of the blame for the War of 1812, Hoffman asserts, the nation’s “most unpopular and divisive foreign war, bar none” (89, 90). In the following chapter, Hoffman sees the North’s triumph in the Civil War as the culmination of questions that partly began in 1519, when Spain first claimed the Mississippi: “Which country would dominate the North American continent, and, would the federal government indeed act as umpire if the states reached a critical impasse?” Hoffman proceeds to discuss nineteenth-century nationalism and Manifest Destiny, calling America during this period, “if anything, anti-imperial” (though also “openly-racist”), noting that America “accomplished six of its seven formal territorial acquisitions by diplomacy or purchase, and one by outright conquest.” Looking at world history, to Hoffman part of the problem of the nineteenth century was “the lack of any international law, authority, or umpire” (94-97). Hoffman includes a fascinating history of China, followed by a detailed history of the lead-up to the Civil War and of American expansion during the period, arguing that “The Mexican-American War precipitated the collapse of whatever national consensus existed on the benefits of expansion into foreign lands.” The Civil War would have destroyed the Union “had the umperial president not stepped in,” Hoffman writes, while also pointing out that “the North did not establish an empire over the Confederacy.” Most important, the conflict rapidly increased “the worldwide trends toward access, arbitration, and transparency.” The expansion of the United States “was often not pretty, but it was hardly a program of Empire” (129-136). Turning to international relations between 1865 and 1920, Hoffman analyzes the acquisition of Alaska, which would ultimately demonstrate that “Expansion was coming to an end. Americans simply did not want more land.” Events in the Dominican Republic would show “the final rejection of Manifest Destiny most plain.” Though actions in the Philippines saw America “briefly embracing European-style imperialism,” she stresses that “unprecedented in all of human history, [America] soon gave up its principle colony and protectorates voluntarily. It backed into imperialism and then turned around and backed out.” Hoffman critiques historians’ claims that the events of 1898 were the end result of America’s desire to foster imperialism by expanding into foreign markets -- “The evidence for this conclusion is not only thin but also largely immaterial, because all businesses seek customers,” noting that prominent business leaders opposed the Spanish-American War. The subsequent Teller Amendment showed that “congressional intent was certainly umperial rather than imperial.” Hoffman sees American intervention in the Caribbean between 1905 and 1933 as “part umpire, part policeman, and part banker,” and calls 1898’s flirtation with colonialism “more like an adolescent identity crisis expressed in Euro-American cross dressing than a determined campaign,” adding that most Americans “rejected colonial khaki” and had “a fundamental distaste for colonialism.” (147-177). In her chapter “The Open Door and the First International Rules,” Hoffman first discusses Wilsonianism (analyzing along the way Immanuel Kant, Victor Hugo, Lord Tennyson, and an extensive look at the world peace movements of the early twentieth century -- this book often seems to cover everything). Hoffman then turns to the Open Door Policy with China, arguing strongly against the notion that “free trade and open doors were equivalent to protectionism and imperialism,” the position of historians John Gallagher, Ronald Robinson, and William Appleman Williams. McKinley and Hay “attempted to devise a viable alternative to imperialism,” and Wilson’s positions and policies “widened the path into a highway.” As president during the First World War, Wilson would “set precedent for later American leaders by explicitly acting like a man apart—a kind of umpire among the warring nations” (192, 196, 206). In the period between the two world wars, America favored “collective security, but it refused to be an enforcer of umpire.” Hoffman discusses the political and economic climate of the world in 1920s and 1930s and the rise of fascism, and offers an interesting year to mark the start of World War II: 1932, when the Japanese achieved control of China north of the Great Wall. Hoffman characterizes the period as an era where “No umpire, empire, or international organization could intervene” (211, 237). In her subsequent chapter on World War II, Hoffman first examines the shift in American public and Congressional opinion from isolationism towards interventionism, noting the enormous strength of the America First Committee by December 7, 1941 (and writing of “a wealthy young Bostonian named John F. Kennedy, who sent a check for one hundred dollars along with the compliment, ‘What you are doing is vital’”). Soon, however, “events overtook arguments” and the U.S. entered the conflict, with Britain and the United States sharing “core values.” Isolationism would not be compatible with a stable world, as “Organically, over the course of time, the United States had become indispensable to maintaining order against the evils of chaos in a crowded, militarized globe” (256). Hoffman sees this is utterly consistent with the Nation’s founding values: “policing among states during an extreme crisis,” with a federal government “to stand astride warring contenders and umpire their rivalry” (259). At war’s end, the world was left with two superpowers, though “one would become an empire, the other an umpire” (247-267). In “The Buck Stops Here,” Hoffman analyzes the crucial years of 1945 through 1947 that led to the creation of the Truman Doctrine, when America “adopted responsibility for ongoing, and sometimes even preemptive crisis management,” a time Hoffman calls “the key turning point in American foreign relations.” To Hoffman, this was what the Founding Fathers had intended: for America to be “an umpire, to compel acquiescence.” The time would also reveal the nation’s “anti-imperial intentions” (272). In 1946 the Philippines became “the first Asian colony to achieve independence” (273), an event that served as a model for other nations seeking autonomy. It also represented “what no other colonial power had yet done: free a colony independently” (271-278). Why, then, the direct confrontation with Russia? To Hoffman, it was because Russia was set upon expanding, threatening the freedom of other nations, and, in addition to the system set up by the Founders, there was the key fact that “the United Kingdom decisively stepped aside in 1947 and challenged the United States to take up the burden.” Hoffman surveys the controversy surrounding the Truman Doctrine, yet stresses “the extraordinary degree of cooperation between Republicans and Democrats” during this period, and that in the speech to Congress announcing the Doctrine, the president “used the term ‘communist’ only once and never mentioned the Soviet Union by name.” Vast majorities of Americans thought the world would soon be at war again; Hoffman sees American policy as trying to prevent another one (282, 290-291). Her final chapter, “A Coercive Logic,” subtitled “Or, How America Spread Freedom and Wealth and Compromised Its ideals, 1947–1991,” examines the “Age of Affluence” that followed World War II, when the U.S. played the decisive role in world affairs, and when “multiple nations accepted U.S. bases because they trusted Americans more than they trusted anyone else to enforce the rules of play that stabilized the world for the second half of the twentieth century” (296). The CIA -- whose first secret project was entitled “Project Umpire” -- was “stealthy,” yes, but was also “the most transparent of the international spy agencies.” Hoffman then offers a fascinating sketch of Mosaddeq in Iran. Though “covert intervention ... cost America much of the moral high ground it had won in World War II,” Hoffman points out how few “were willing to vote with their feet and migrate from” America to the U.S.S.R. (294-308). Hoffman stresses how five very different presidents all felt compelled to fight communism in Indochina, noting that the attempt to stop the spread of communism “appeared worthwhile when it succeeded, as it did in Germany and South Korea, but foolish and corrupt when it did not, as in Vietnam.” By the First Gulf War, “it was as if America’s global responsibility had grown rather than declined over the decades.” But perhaps, with the Cold War’s end, “the umpire might retire.” Hoffman ends with a discussion of the geopolitical chessboard that led to the end of the Cold War. “In 1991, the age of empire ended,” she argues (330), noting that “Values that America valiantly defended during the Cold War spread” (309-332). In her conclusion, “Good Calls, Bad, Calls, and Rules in Flux; Or, Who Wants to Be Ump? 1991–Present,” Hoffman argues, post 9/11, that “calling the United States an empire has yielded no practical solutions because the nation and the world system in which it fits are simply not structured in that way.” Instead, Hoffman sees America as “the enforcer of what is, most of the time, the collective will: the maintenance of a world system with relatively open trade borders, in which arbitration and economic sanctions are the preferred method of keeping the peace and greater and greater numbers of people have at least some political rights.” Critiquing Williams, Hoffman argues that “American diplomacy in the twentieth century has been far more triumphant than tragic.” America is not an Empire, but rather a “player-umpire.” This is “not completely fair to anyone, the umpire or the other players. But it is often better than having no ump at all” (336-352).